With a warm and now already familiar atmosphere of cooperation, the Vice President of the Serbian Parliament and Chairman of the Group of friendship Serbia-Order of Malta, Hon. 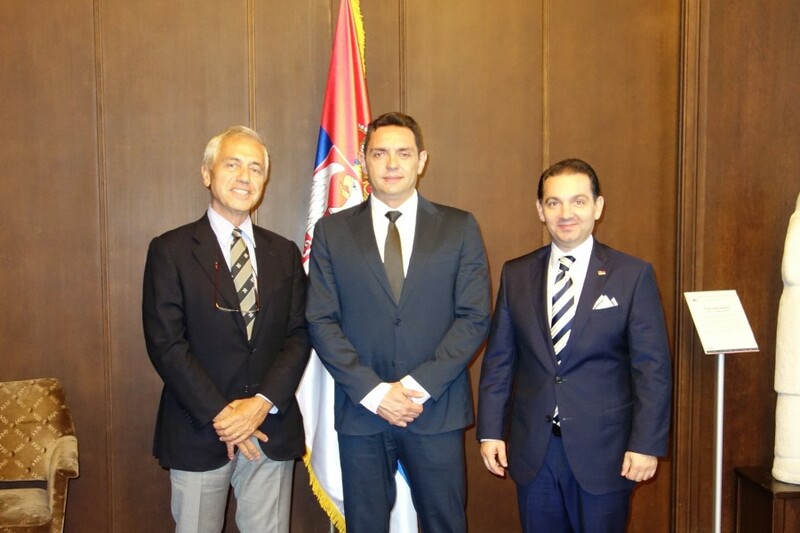 Vladimir Marinkovic welcomed, in the Parliament of Belgrade, Ambassador of the Sovereign Order in Belgrade, Alberto di Luca. At the meeting, which was attended by several MP’s, including the Head of the PAM Serbian Delegation (Parliamentary Assembly of the Mediterranean), Hon. Nevena Stojanovic, Hon. Sasa Maksimovic, Hon. Vesna Rakonjac, Hon. Velinka Tosic, Hon. Branko Djurovic and Hon. 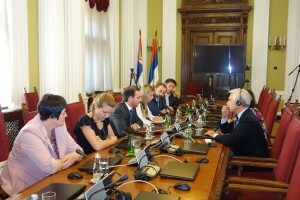 Nebojsa Tatomir, unanimous was the consent and the gratitude expressed by the Serbian Parliamentarians for the important charity-dinner held in Monte Carlo on June 19th in favor of the project “Make a Wish” aimed at boys and girls residing in the flooded areas of last May 2014. There were also discussions for other humanitarian initiatives and projects for 2016. The meeting ended with the invitation of the Ambassador Alberto di Luca at the ceremony of “delivery” of the WISHES which will be held on October 13th. The Minister of Labor, Employment and Social Policy, H.E. Aleksandar Vulin, met today at Palace Serbia (Palata Srbije), the Ambassador of the Sovereign Order of Malta, Alberto di Luca. During the meeting they discussed about the humanitarian assistance that the Order of Malta provides the Republic of Serbia, and the future cooperation and humanitarian actions to help Serbian citizens most in need, especially the children. Ambassador di Luca spoke about the success of the project “Make a Wish”, aimed at girls and boys affected by the floods of May 2014. The Minister Aleksandar Vulin said that any help is welcome, because child care is one of the most important aspects for the Ministry of Labor, and it was agreed that the project “Make a Wish” must be an example for future programs for socially disadvantaged children. To step up prevention and develop rehabilitation therapies for leprosy patients in Vietnam: this is the ambitious project of Ordre de Malte France, present in Vietnam for over 40 years with leprosy treatment and prevention programmes. Thanks to a generous donation from the Republic of China (Taiwan), the project can now be launched in its entirety. There are three key stages for the initiative: to make operative the recently restored Malta pavilion in the functional rehabilitation department of the Ho Chi Minh City hospital; to improve the quality of healthcare offered with mobile medical units, carry out more reparative surgery and better prevention; invest in the training of local health professionals. Thanks to an agreement with the Order of Malta in 1991, the hospital department in Ho Chi Minh City, a densely populated town in south Vietnam, has been fully renovated. It is now an independent pavilion on three floors covering a total area of 1,600 square metres equipped with rehabilitation and physiotherapy rooms. The project will involve over a thousand patients, based on the fact that in Vietnam some 300 new cases of leprosy are diagnosed every year. After the Philippines and China, this is the south-east Asian country with the highest prevalence of documented cases, albeit significantly less than 30 years ago when some 5 million people were affected worldwide. One of the greatest challenges continues to be reintegration in the community of patients with Hansen’s disease, often excluded and discriminated against. The Order of Malta’s work is concentrated on this aspect. 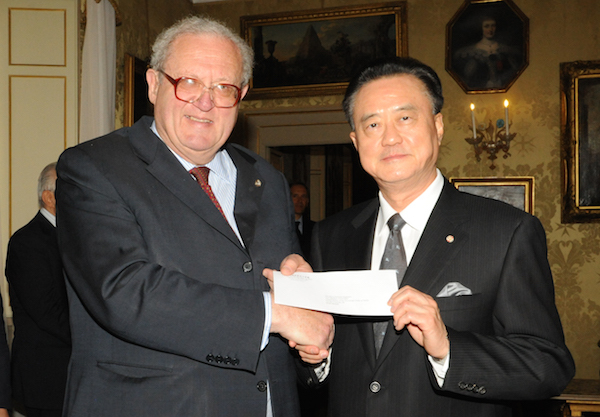 The Grand Master of the Sovereign Order of Malta, Fra’ Matthew Festing, spoke of his appreciation for the donation during his speech to Ambassador Larry Wang: “The Republic of China (Taiwan) is one of the most economically and technologically advanced countries. Nonetheless its numerous social welfare initiatives still help disadvantaged persons and communities”. Ordre de Malte France has also been cooperating with the Ho Chi Minh hospital for over 25 years in mobile surgery missions and in transferring medical technologies to the countries bordering Vietnam, such as Laos and Cambodia. 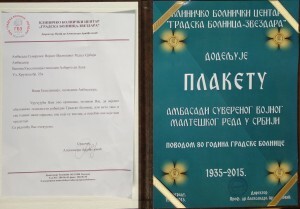 This year’s National Day of St. John the Baptist, traditionally organized by the Embassy of the Sovereign Order of Malta in Belgrade, was honored by the participation of the President of Parliament, Maja Gojković. 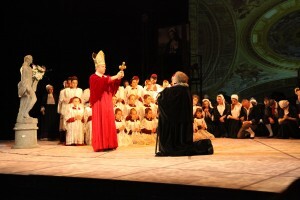 At the picturesque setting of the National Theatre, in the presence of 550 people and more from institutional, religious, diplomatic and cultural backgrounds, Ambassador Alberto di Luca has addressed his greetings on behalf of the Grand Master of the Sovereign Order, Fra ‘Matthew Festing, emphasizing the excellent relations between the Order of Malta and Serbia and the continuous successful development of bilateral cooperation. The Ambassador di Luca has also focused on the important project “Make a WISH”, dedicated to girls and boys affected by the floods of May 2014, highlighting the importance of collaboration with other countries, in particular with the Principality of Monaco where, on June 19th, was held a charity fund raising dinner which has achieved the amount of € 100,000 worth of possibly realizable WISHES expressed by the children in their letters to the Embassy of the Order in Belgrade. 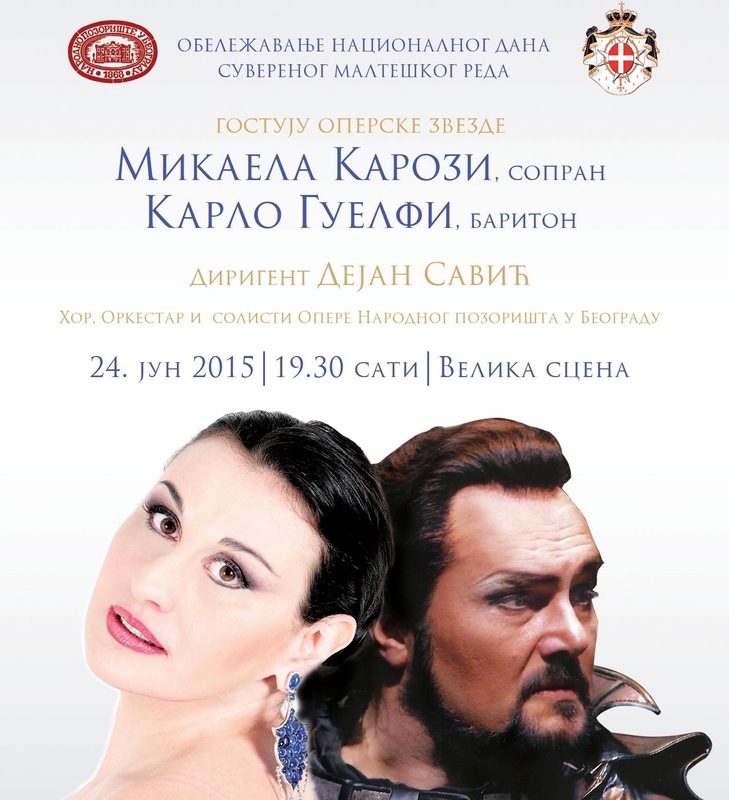 The baritone Carlo Guelfi and soprano Micaela Carosi have then charmed the large audience – that stood in ovation for several minutes- with their masterful interpretation of “Tosca” by Giacomo Puccini, under the musical leadership of Maestro Dejan Savic. 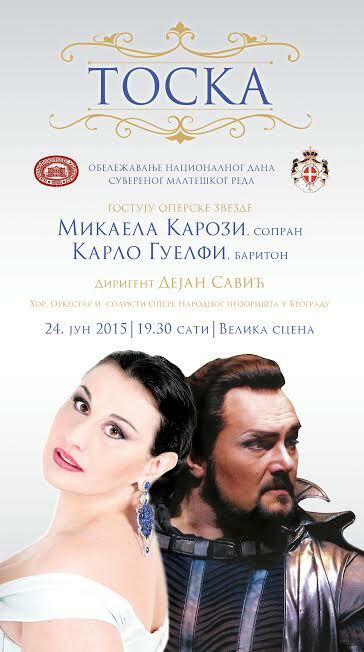 A great success for this splendid Opera, special one time performance, that has been proposed to lovers of classical music in Serbia by the Embassy of the Sovereign Order of Malta on the occasion of its National Day. 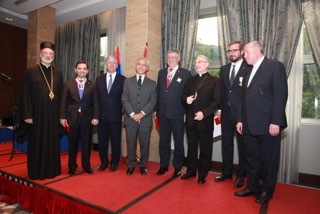 At the end of the Opera, in the foyer, the guests toasted to the friendship between Serbia and the Order of Malta and to the success of many initiatives that the Embassy in Belgrade organized over the past year: from the supply of large quantities of food and clothing to important medical equipment donated to the Hospital KBC Zvezdara; from the new edition of “A hot meal on a cold winter” to the project “Make a WISH to the Sovereign Order of Malta”, attracting so much interest and support in the country. Alongside the President of Parliament, Maja Gojkovic, were also present many MPs, including the Chairman of the Group of friendship between Serbia and the Order of Malta, and Vice President of Parliament, Hon. Vladimir Marinkovic. Together with the Apostolic Nuncio representing the Holy See, H.E. Msgr. 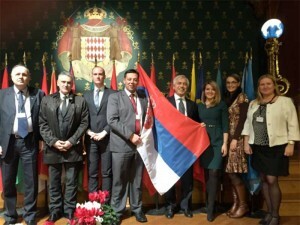 Orlando Antonini, were present many Ambassadors and diplomats accredited to Belgrade: H.E. the Ambassador of Albania, Ilir Bocka; H.E. the Ambassador of Australia, Julia Alice Patricia FEENEY; H.E. the Ambassador of Belarus, Vladimir CHUSHEV; H.E. 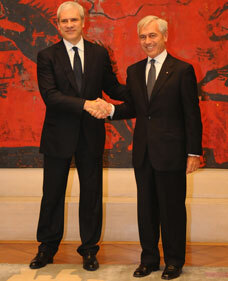 the Ambassador of Brazil, Sergio Luis CANAES; H.E. the Ambassador of Bosnia and Herzegovina, Ranko Škrbić; H.E. the Ambassador of Bulgaria, Angel Simeonov DIMITROV; H.E. the Ambassador of Canada, Philip Herbert Pinnington; H.E. the Ambassador of Egypt, Menha Mahrous Bakhoum; H.E. the Ambassador of Montenegro, Branislav Micunovic; H.E. the Ambassador of Morocco, Abdellah ZEGOUR; H.E. the Ambassador of Romania, Daniel BANU; H.E. the Ambassador of the Russian Federation, Alexander Chepurin; H.E. the Ambassador of Slovakia, Ján VARŠO; Deputy Head of Mission of the Embassy of Germany, Michael Hasenau, and Charge d’Affaires of the Embassy of the Ukraine, Yevheniia Filipenko. The proximity to cultural institutions was witnessed by the President of the Academy of Arts, Dusan Djokovic. 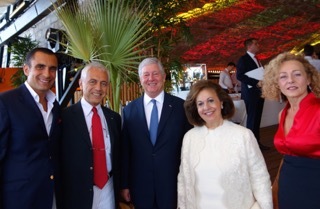 Very welcomed guests were also the Princess Elizabeth Karadjordjevic, the director of the Hospital KBC Zvezdara, Dr Aleksandra Arandjelovic, the CEO of Generali Insurance, Dott. Andrea Simoncelli, the director of the daily newspaper Politika, Ljiljana Smailovic and director of RTS, Dragan Bujosevic. 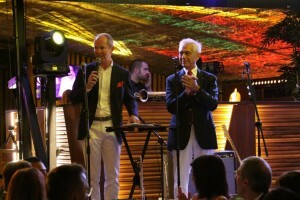 In an atmosphere of friendship and solidarity, made even more enjoyable by the beautiful terrace on the seaside and the lovely melodies of famous artists, was held, at the restaurant Twiga of Monte Carlo, the evening in support of the project “Make a WISH” promoted by the Embassy of the Sovereign Order of Malta in Belgrade in favor of Serbian girls and boys affected by the 2014 severe floods. 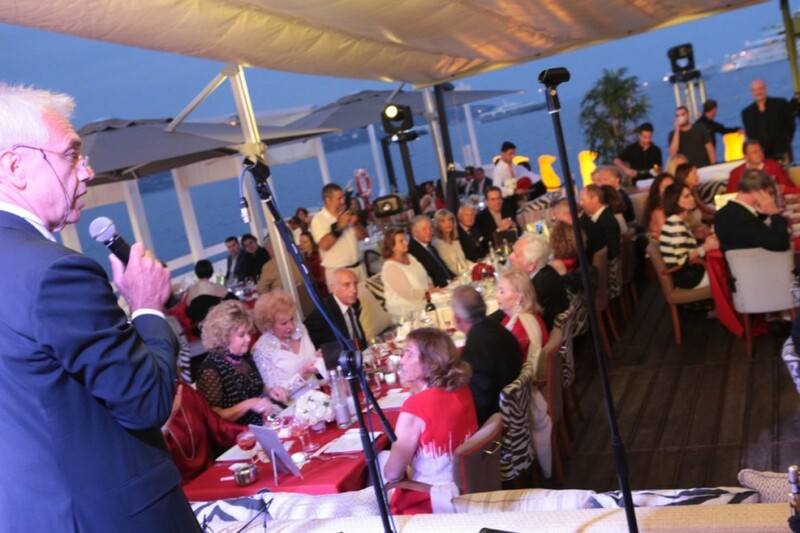 The charity event – organized by HRH Prince Michael of Yugoslavia and entrepreneurs Flavio Briatore (Billionaire Group) and Luca Marzocco (Satri Group and Marzocco Group), alongside their respective spouses Elisabetta and Sarah – was attended by over 148 personalities from Serbia, Monaco, Italy and France. Prince Albert II of Monaco and the Grand Chancellor of the Sovereign Order, Albrecht von Boeselager, sent messages of appreciation and good wishes for the success of the initiative. 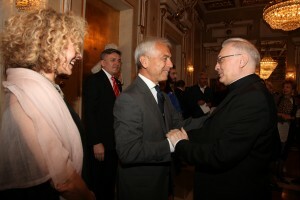 The Ambassador of the Order of Malta to Serbia, Alberto di Luca, and his spouse Emanuela, alongside the promoters, welcomed the distinguished guests: the Head of the Royal House of Serbia, HRH Crown Prince Alexander II and Crown Princess Katherine from Serbia, came specially for the occasion from Belgrade; H.E. Msgr. 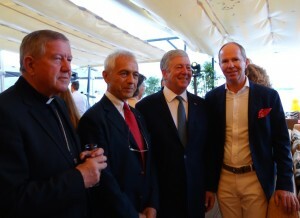 Stanislav Hocevar, the Catholic Archbishop of Belgrade and President of the Episcopal Conference of Serbia, also arrived from Belgrade; the Order’s Ambassador to the Republic of Malta, Umberto Di Capua and his spouse Marinella; the Knight of Grace and Devotion of the Order – and 17 years President of COM.IT.ES in Monaco – Count Niccolo di Chiusano; Marco Casiraghi, CEO of ENGECO, with his spouse Cecilia; Stelios Haji-Joannou, President and majority shareholder of Easyjet Airways; absent but important supporters of the praiseworthy purpose of the evening, Gerard Cohen, Chief Executive of HSBC Monaco, Sir Philippe Green, Chairman of the Arcadia Group and Alberto Hazan, President of Radio Monte Carlo that has, among other things, opened a collection funds for the project through the pages of the site www.radiomontecarlo.net. 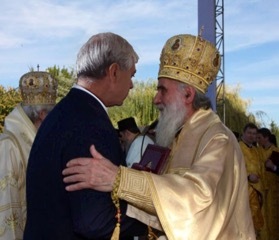 The guests listened to the modalities of the initiative from Prince Michael: the Commission of the project, of which is Patron HRH Crown Prince Alexander II, will proceed with the selection of the 1793 WISHES arrived at the Embassy that will be delivered at the official ceremony to be held in Serbia, on October 13th, on the feast of St. Gerard, founder of the Sovereign Order of Malta in 1048. Below, the full speech of Prince Michael followed by the speeches of greeting and gratitude of Crown Prince Alexander II and Ambassador di Luca. On behalf of Mr. and Mrs. Briatore and of Mr. and Mrs. Marzocco, I would like to extend our most sincere thanks and give you the warmest welcome for participating at this first event to support the project “Make a Wish” promoted by the Embassy of the Sovereign Order of Malta in Belgrade in favor of the children of the elementary schools that were living in the areas devastated by the floods of 2014. The Wishes of these children have brought us their dreams, their needs, their aspirations. Each one of their wishes, that together we will be able to make happen, will correspond to the very same philosophy of the millennial Order of Malta – today present in 120 countries – which is to help those who suffer, to extend a brotherly hand, to offer material or moral help. From the start of this worthwhile initiative, the Embassy has received more than 3500 letters, of which 1793 have the characteristics that correspond to our sensibility tonight as well as to those of our sponsors and benefactors from Serbia, from the Principality of Monaco, from France, from Italy and from Taiwan. The commission that will grant the wishes is tonight represented by its Patron, my cousin Prince Alexander. Thanks to the generosity of all of us present, the commission will be able to choose which wishes will become a reality. The official ceremony of delivery of the gifts will happen on the 13th of October 2015, on the liturgical day of Blessed Gerard, founder and Patron of the Sovereign Order of Malta. A young boy, with old parents and a tetraplegic sister, asked for a bath lift so she can take a bath, because the age of his parents makes it almost impossible for them to handle her. Other children asked for a van for the school, so they can overcome the collapse of certain infrastructures. Others would like musical instruments, so they can play. Many kids would like to have again, or have for the first time, a personal computer. A young girl who has a paralyzed brother has asked for an electric wheelchair so he can go up and down the hill around his house. And there are other wishes less dramatic but equally beautiful: to be taken for a day to Belgrade and be able to meet in person their idol: Novak Djokovic. I would like to extend a special thank you to H.E. the Grand Chancellor of the Sovereign Order of Malta, Baron Alfred von Boeselager, who, though he is not able to be with us due to his busy schedule, has sent a very kind message to Ambassador di Luca in which he wishes us a great success and conveys his appreciation for our event. I also want to extend a warm thank you to H.S.H. Prince Albert the 2nd for the affectionate letter he wrote to me, assuring us of his support and best wishes. Together with my friends Flavio and Elisabetta Briatore and Luca and Sara Marzocco, we realize how important and necessary it is to do something concrete towards the wishes of the Serbian children that have been handicapped by a natural catastrophe that limits them in their quality of life and in their growth, which they are entitled to. I see that we are148 people tonight and with us by thoughts we have other friends who have sent us donations and support. I am convinced that the success of this evening – for which I want to congratulate the first Secretary of the Embassy of the Order in Belgrade, Giorgio Giuliano and Mrs. Vannina Mandelli – even though we will not be able to grant all the wishes, will be essential in making happy many of the children who have sent us letters. For that we must rejoice. I want to extend my compliments and thanks to the musicians and the artists who enchant us with their talents and create such a wonderful atmosphere for this evening, on this lovely terrace on the sea. We know how many lovely initiatives of solidarity happen every year in Monaco and I feel honored and pleased to be among the promoters of this first event, unprecedented in Monaco under the name of the Order of Malta. I thank you again for your generosity and would ask all of you to remain close to our project and seek the support of more friends so that our chain of solidarity can grow and bring smiles and joy to the children of our beloved Serbia. I raise my glass for the prosperity of Serbia, the principality of Monaco and the Sovereign Order of Malta. 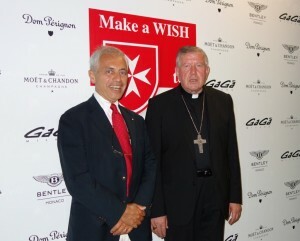 My wife and I are very happy to be here with you tonight, at the “Make a Wish to the Order of Malta” charity event aimed at children residing in the flooded areas of Serbia. My country is still struggling to remove all the consequences of the last year’s enormous natural disaster. 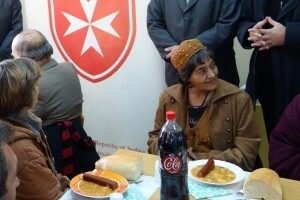 My wife and I are very moved by the Sovereign Order of Malta’s wonderful initiative to bring joy to the Serbian children from the flooded areas. By fulfilling their wishes, you are making the lives of these children happier and you are strengthening their belief in solidarity. It warms my heart to see that this project has drawn such great attention and I am very proud to be a member of its commission. 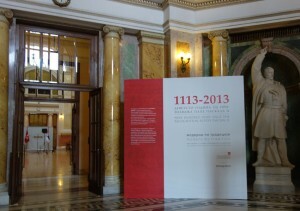 I am looking forward to the final ceremony of the project, which will take place in Belgrade this October. In the historic building of the Ministry of Foreign Affairs, was held this morning the warm meeting between the First Deputy Prime Minister and Minister of Foreign Affairs, Ivica Dacic, and the Ambassador of the Sovereign Order of Malta in Belgrade, Alberto di Luca. During the meeting, were touched mainly the issues related to the intense humanitarian activities of the Order of Malta organized in the country. 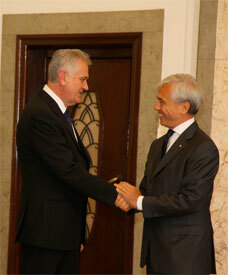 Also discussed, was the possible signing of the Postal Agreement between Serbia and the Order of Malta. 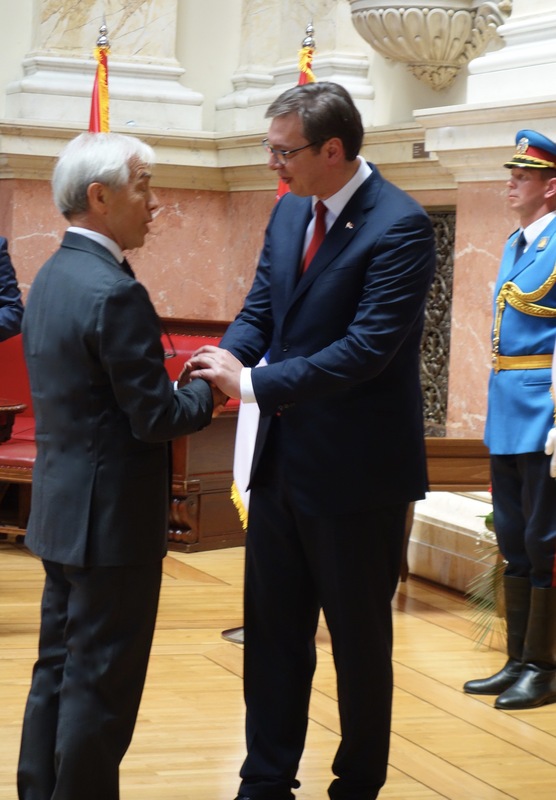 The First Deputy Prime Minister and Minister of Foreign Affairs, Ivica Dacic, was so impressed by the activities of the Order in Serbia, that he asked the Ambassador di Luca to invite to Belgrade the Grand Chancellor H.E. Albrecht Freiherr von Boeselager. The Embassy of the Sovereign Order of Malta in Belgrade was able to collect the availability of the Milanese hospitals IEO and Monzino, who are collecting, for the second time, medical equipment to be sent in Serbia to the hospital KBC Zvezdara. The President of IEO and Monzino, and First Counsellor of the Embassy of the Sovereign Order of Malta in Belgrade, Carlo Buora, defined with the Director of the hospital, Prof. Dr. Sc. Aleksandra Arandjelovic during these past days in Belgrade, all the modalities of shipment. During the meeting, all operational details were defined with the Director, Prof. Dr. Aleksandra Arandjelovic. 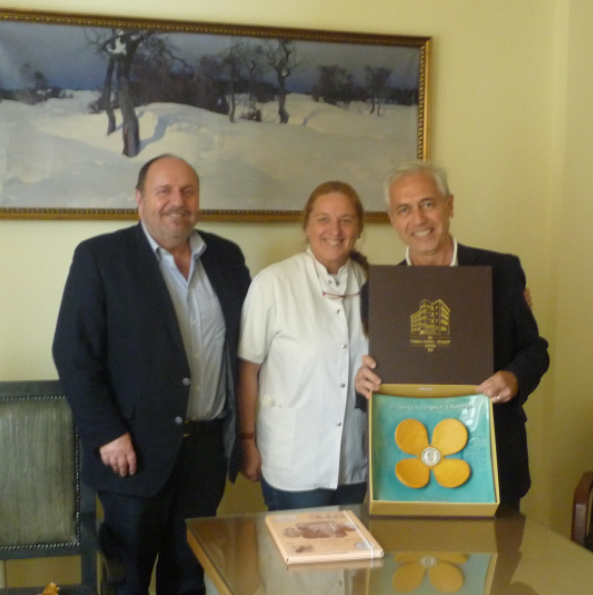 The Director delivered to the Ambassador Alberto di Luca and Counsellor Valter Catoni a ceramic made for the occasion of the 80th anniversary of this important sanitary institution of Serbia. 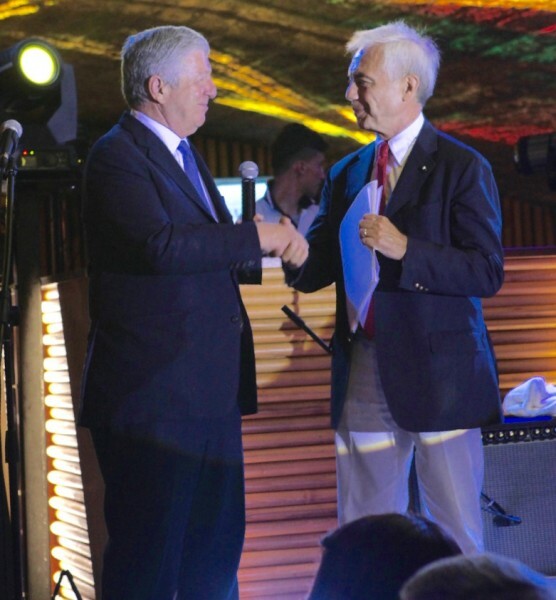 In the presence of President Tomislav Nikolic, at the National Theatre in Belgrade, was held the ceremony for the 80th anniversary of this important health institution. During the evening, were presented the results and future projects and plans of the hospital KBC Zvezdara. Particularly pleasing was the recognition delivered to the Embassy of the Sovereign Order of Malta for its past and future collaborations. 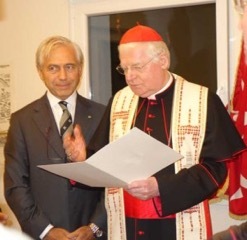 The favorable consensus received of the “Make a WISH to the Sovereign Order of Malta” and the requests from children who were unaware of the possibility of participation to the project until now, suggested the extension of the deadline for submission of letters to over March 13th. It will be possible to send the letters of submission, at the same address of the Embassy of the Sovereign Order of Malta in Belgrade, until March 30th, according to the modalities of participation visible on this website.